The PM has just chaired a cabinet meeting on Brexit strategy and will make a statement to MPs at 1230 GMT. Six or more Remain-supporting ministers could quit unless she rules out no-deal in her statement. But one of the PM's closest allies has warned pushing back the 29 March exit would not make getting a deal easier. The BBC's Nick Watt says the feeling is Mrs May will "lean into" the rebel ministers' demands and Brexiteers have been told to expect a "very difficult message". She has just returned from a summit in Egypt where she held a number of meetings with EU leaders and continued to press for more concessions to placate critics of her deal, in particular on the Irish border backstop. News of the growing unrest within the cabinet came after Labour announced a significant shift in its policy - a decision to back another referendum if its own alternative Brexit plan is rejected. What are the ministers demanding? Mrs May's Brexit deal was comprehensively rejected by MPs on 15 January and she has said they'll get a second chance to vote on it - possibly with some changes - by 12 March. 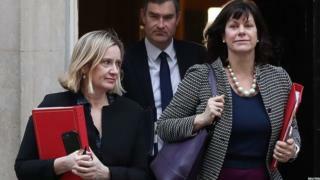 But writing in the Daily Mail, ministers Richard Harrington, Claire Perry and Margot James said Mrs May must promise now that she will rule out the possibility of the UK leaving the EU without a deal if her agreement is rejected again, and instead seek a way to delay. Mr Harrington, a business minister, told the BBC's Victoria Derbyshire that it was "absolutely absurd" that, with 31 days to go before the UK is due to leave, a no-deal exit was still a possibility. "The idea that no deal is a negotiating tool is absolutely incorrect. No-one believes it in the EU. As far as we are concerned the responsible thing is to rule it out." Unless Mrs May was willing to provide the necessary reassurances, he said he would vote for Parliament to "take control" of the process by backing an amendment - a legislative tool - being put before the Commons by Labour's Yvette Cooper and Conservative Oliver Letwin. If passed, it would give MPs the power to demand a delay to Brexit if a deal cannot be agreed by 13 March. He said he was prepared to rebel and quit, if necessary, insisting this would be the "honourable thing" to do. "Warm words alone will not be enough. It has to be a clear undertaking that she is prepared to remove no-deal and have a short extension to Article 50." Three other senior cabinet ministers, Greg Clark, Amber Rudd and David Gauke, have already signalled they could also be prepared to vote for the Cooper-Letwin option if there is no breakthrough in the next few days. Mrs May has long resisted any suggestion that the UK's departure from the EU could be postponed beyond 29 March. Leading Tory Brexiteer Esther McVey, who quit the cabinet in November, said those pressuring the PM to rule out no deal should be making their views known in private. Going public showed they were "losing their nerve" and "bottling" it, she told the BBC. "These people should not be threatening and going to the papers and weakening her hand. If they are going to go, then just go." If the UK did leave without a formal agreement on 29 March, she said the UK and EU should enter into what she described as a short "static period" where everything remained the same. This, she said, would give both sides the time and space to discuss how trade would operate, such as what, if any tariffs, would apply to imports and exports. Cabinet Office Minister David Lidington said that calls to avoid a no-deal Brexit by delaying the deadline for leaving the EU did not resolve the issues. "It ends up simply deferring the need to face up to taking decisions. It's not an actual course of action in its own right," he told the BBC. How has Labour's position changed? Labour has said it will support the Cooper-Letwin amendment, making its chances of success far higher. But leader Jeremy Corbyn also wants to use Wednesday to put his own plan for Brexit - which includes a "comprehensive customs union" with the EU and "close alignment" with the single market - before the Commons. He told his MPs on Monday night that if - as expected - that plan is rejected, the party will formally throw its weight behind another public vote. Shadow Brexit secretary Sir Keir Starmer said that if Labour's Brexit proposals did not get through Parliament "we, the Labour Party will either put down ourselves, or support an amendment, in favour of a public vote". That vote, he added, "ought to be on the option, on the one hand, of a credible leave deal and. on the other hand, remain". Video Brexit: What does Corbyn's announcement mean? What does Labour's announcement mean?